Tom Glavine is a five-time 20-game winner, a two-time Cy Young Award winner, and one of only 24 pitchers (and just six left-handers) in major league history to earn 300 career wins. Glavine was born in Concord, Massachusetts and raised in Billerica, Massachusetts. 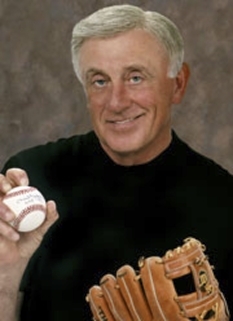 He attended Billerica Memorial High School, where he excelled as a student and was a letterman in hockey as well as baseball. In hockey, as a senior, he was named the Merrimack Valley's Most Valuable Player. 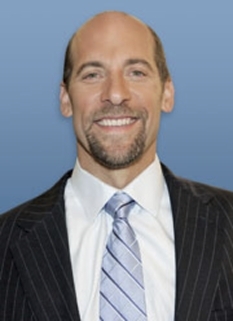 In baseball, he led his team to the Division I North Title and the Eastern Massachusetts Championship. Glavine was drafted by both the Los Angeles Kings in the 1984 NHL Entry Draft (in the 4th round, 69th overall—two rounds ahead of future National Hockey League star Brett Hull and five rounds ahead of Luc Robitaille, both 2009 Hockey Hall of Fame inductees) and the Atlanta Braves in the 2nd round of the 1984 amateur baseball draft. 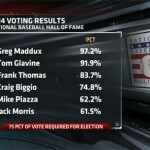 Glavine elected to play baseball and made his major league debut on August 17, 1987. Glavine enjoyed good times and bad times during his first several years in the majors, compiling a 33–43 record from 1987 to 1990, including a 17-loss performance in 1988. His fortunes turned around in 1991, when he won 20 games and posted a 2.55 earned run average. It was his first of three consecutive seasons with 20 or more wins and saw him earn his first National League Cy Young Award. Glavine became the ace of the Braves' starting rotation that also included Steve Avery, Charlie Leibrandt, and another future NL Cy Young Award winner, John Smoltz. 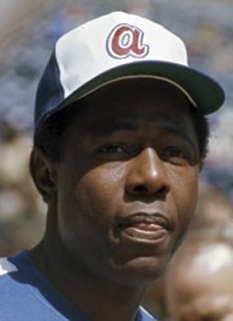 His season helped ensure a dramatic reversal in the Braves' competitive fortunes as they won the National League pennant and earned a trip to the World Series, where they lost to the Minnesota Twins in seven games. Atlanta had long been thought of as a perennial cellar dweller, but became one of the most successful franchises of the 1990s with the help of Glavine and their tremendous pitching staff. After the Braves acquired Greg Maddux from the Chicago Cubs in 1993, Glavine, Maddux, and Smoltz formed one of the best pitching rotations in baseball history. The three of them combined to win seven Cy Young Awards between 1991 and 1998. 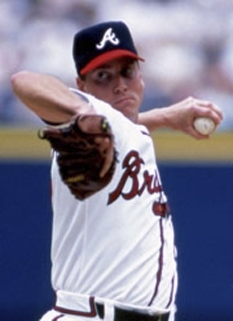 Glavine won his second Cy Young Award in 1998, going 20–6 with a 2.47 ERA. 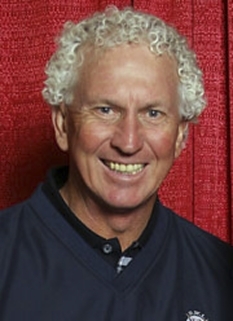 Glavine was named MVP of the 1995 World Series after he won two games in the six-game series with the Cleveland Indians. In addition to the championship won with the Braves in 1995, he also played on four other World Series teams (in 1991, 1992, 1996 and 1999). The trio of Braves pitchers was split up in 2003 after Glavine joined the New York Mets and Maddux joined the San Diego Padres (Smoltz remained with the Braves). Glavine was up and down in his first few years with the Mets, but returned to his old form during the 2006 season. He finished one victory shy of the NL lead in wins and was selected to the All-Star team. 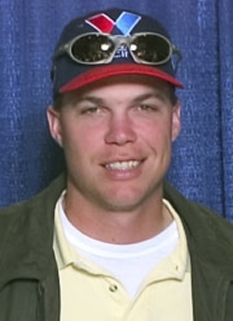 Glavine finished the 2006 season with a 15–7 record and a 3.82 ERA in helping the Mets win the National League Eastern Division. Glavine earned his 300th career victory on August 5, 2007, becoming the 23rd pitcher to reach the 300 game milestone. Following the season, Glavine declined a contract offer with the Mets and signed a one-year deal to return to the Braves. 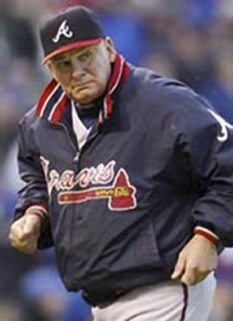 Early that season, Glavine was placed on the disabled list for the first time in his 22-year career. His final game came in August 2008 as he was unable to rehab from recurring shoulder injuries. He announced his retirement officially in February 2010. The following August, the Braves retired Glavine’s #47. DISCLAIMER: PFP Sports Talent Agency does not claim to represent itself as the exclusive agent for Tom Glavine. 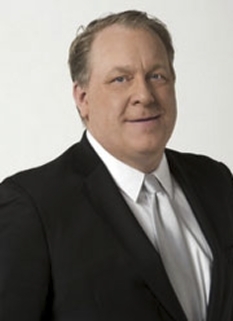 PFP Sports Talent Agency is a booking agency that represents organizations seeking to hire pro athletes and sports personalities such as Tom Glavine for speaking engagements, personal appearances, product endorsements and corporate entertainment. Fees on this website are estimates and are intended only as a guideline. Exact fees are determined by a number of factors, including the location of event, the talent’s schedule, requested duties and supply and demand. PFP Sports Talent Agency makes no guarantees to the accuracy of information found on this website and does not warrant that any information or representations contained on this website will be accurate or free from errors. We are often asked how can I find out who is Tom Glavine's agent? To find Tom Glavine appearance fees and booking agent details, you can contact the agent, representative or manager through PFP Sports Talent Agency for speaking fee costs and availability. PFP Sports Talent Agency can help your company choose the ideal sports personality for your next marketing campaign. To hire Tom Glavine for an appearance, speaking event or endorsement, contact Tom Glavine's booking agent for more information.